I worked on Adeyemo Alakija street in V/I. One day I had to carry out a transaction at the bank. I had five million naira cash in my possession; it wasn’t an official transaction thus I couldn’t interfere with the company’s drivers schedule for a bank run. The bank I needed to pay in the money to was about five blocks before my office, only problem was it was a one way street and I would have to drive round the block in traffic for another 30minutes or so to get to a destination that was about a five minute walk, I wasn’t ready to do that or deal with finding parking around the bank. 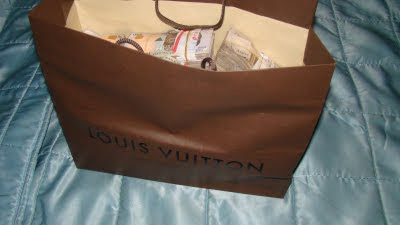 So I picked up the Louis Vuitton carrier bag with stacks of one thousand naira notes, and headed out to the bank. As scared as I was, I was quite confident that no one would approach me because they had no idea what I carried although I was quite creeped out when okadas drove by me. No one expects the nice looking lady to be holding five million naira cash on a busy road, that’s what gave me guts to keep going. I can’t say how relieved I was when I eventually stepped into the gates of the bank. See, we’ve all got treasures hidden in us, and we walk the streets of the world and no one knows what we carry because we’ve got it hidden in a nice carrier bag. We have nice jobs, or not so nice jobs that feel empty, but we do them anyway while the treasure just sits dormant in these bags. If people had an idea what I carried that afternoon, the thieves would try to steal it, and the sensible ones would try to beg me, because what I’ve got is an answer to their problems. If you don’t show what you’ve got, no one would have need for you, because they have no idea what you've got. Sing if you can sing, dance if you can dance, make hair if you can do that. Don’t roam this world with your treasure hidden, even in the nice job that makes you feel empty, find a way to display your talents. In the world our physical treasures need to be hidden to be safe, but the treasures within us, the one that is worth more than material things are not given to be kept away safely. They are given to be displayed on the streets of the world, they are given so people can come and draw from them, get blessed by them. Yes, some people would try to take advantage of you, like thieves would have tried to rob me if they knew what I carried. But let them try, that’s no excuse to hide out. There will always be people ready to undermine what you do, steal your ideas, use you for their gains… but don’t let that stop you. Take the risk. There are people who are up there with their talent, but don’t let that stop you. i.e Beyonce is way up there with her talent, and there you are with more treasure than she’s got and you’re still so far from where she is. Listen, the only difference is that the streets she displayed her treasure on had more people or the right people. It doesn’t make you less talented, you still sing better, display it on your street and someone from the right street would see and desire to draw from you. If its only about blowing, then you don’t know what you have. In Luke 19:20 The third servant made no returns from the treasure given him, he said “I hid your money and kept it safe” God doesn’t want you to hide your treasure, to play safe with it. Put your treasure to good use… and even more will be given. New ideas to be the best at what you do, unique in your field. Hmm, I am not sure I'd have been able to carry such money, but I love your analogy. And again you do not fail to deliver. I should put to practice your message (God helping). What an inspiring and encouraging message! This is should printed and shared with the world! Thank you so much for the encouragement!